The first ‘People in Landscapes’ photo shoot of 2018. The contents of the house filled the hallway waiting to be packed into the truck. Were we moving? How long are we going for? I tentatively asked.. well.. whispered. The tripod was there.. tick. Oh and the camera bag. Don’t forget that! My checklist complete. Tonight we would be staying in one of the Hobbit Houses at Glencoe Mountain Resort so Koala wanted the duvet and pillows… and blankets. I best put the sleeping bags back in the shed then? The truck was full, so off we set filled with anticipation. Koala had checked her Met Office app last night.. the forecast for today was cloud. We had a window of drama to meet. It was an engagement shoot for Sophie and Thomas, a lovely French couple. Koala read their message. They had arrived in Glencoe, they were excited but there was no light they reported. ‘Reflector!!!! !’ Koala screamed as I avoided swerving onto the Broxden roundabout. ‘We’ve forgot the reflector.. we need the reflector!’ I regained control of the truck and considered the ‘we’ve forgot ‘ bit of her exclamation. There were a couple of options.. but I opted for silent diplomacy and turned around to drive back home.. thankful that ‘we’ had remembered after driving only half an hour?! We returned home. Reflector.. and that flask of coffee we’d also forgot.. packed. The truck slid dramatically sideways as we pulled off the farm track back onto the road. I smiled and remembered the ‘Driving-a-Landrover-at-speed’ course that I once did in the Army. I reminisced. Who’d ever have thought it would be put to good use!? We were on our way, it started to rain. Koala is stressed. She’s quiet. Perhaps I will let her choose the playlist. ‘We are late.. we’ll miss any light.. we need to hit the ground running..!’ Koala was mumbling to herself. It wasn’t a good start. How about 80s rock darling? I suggested hesitantly.. she likes that. She didn’t. ‘Why haven’t you got Spotify??? !’ Uh oh. It was still raining. ‘…we need to get a shot today then I’ll be easier to get on with tomorrow.’ That was ominous. I’m sure the couple will be excited darling. I smiled supportively. Then… Rannoch Moor came into view through the murk. There was drama. Snow on the hills.. reflection on the lochans.. I could feel the breath being taken by Koala. ‘Look!! Look at the reflection..this is it. We need to be here!’ She was animated. I breathed again. 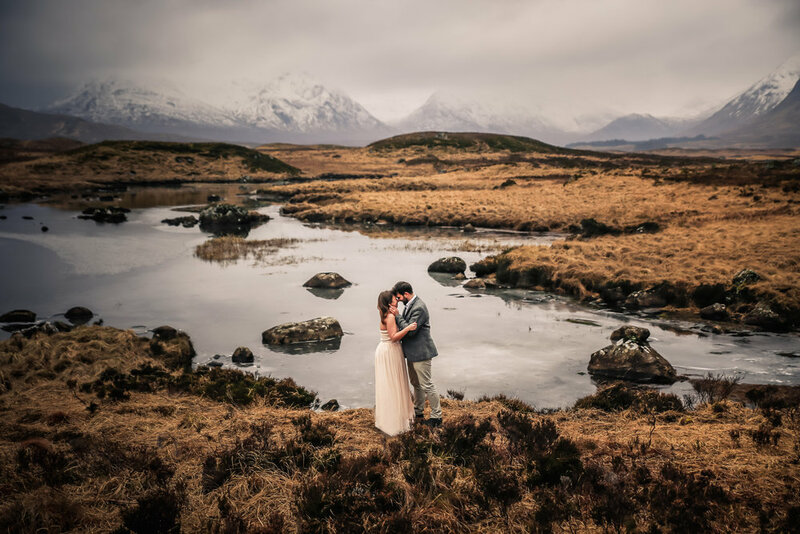 Sophie and Thomas were there waiting in the carpark at Glencoe Mountain Resort.. eagerly dressed in their dress and suit finery….surrounded by skiers, snowboarders and wet West Highland Way walkers. The contrast wasn’t lost.. even on me. Koala was happy now. Sophie and Thomas were excited.. unaware that I didn’t have Spotify. It was a classic Scottish winters day for a portraiture shot.. Rannoch Moor delivered the reflection, the dramatic snowy backdrop of the Black Mount, the biting wind of hypothermia. Oh how we laughed!! Thankfully they laughed too. They were freezing. Sophie was in a backless dress but they made the shoot! It was an engagement and it showed. I was almost sentimental as I made coffee.. in the rain.. from the boot of the truck. Koala had got the shots for the afternoon but it was getting dark. ‘Do you think that’d be a good location for tomorrow?’ Koala asked looking skyward. I looked up through the looming darkness of Glen Coe.. it was raining. I was resigned to my fate and walked up the hill to have a look. I reported back.. wet. It was indeed a great location for tomorrow I sniffed. Well.. it looked ok in the dark and Koala was happy. Day 1 complete and we returned to the Mountain Resort, our home for the night. The Hobbit House. We are familiar with the eco-pods at the Glen Coe Resort. They are indeed cosy little places… as wooden sheds with bunk beds go. But ideal in a warm place to get your head down after a long day on the hill kind of way… and Koala reminds me that she is from the Southern Hemisphere. ‘This is feckin Scotland. It is winter.. I’m not camping! !’ Probably wasn’t wise to mention that Koala had expected Sophie to be in a backless dress all day. ‘Do you want to suffer now or later?’ Koala isn’t known for her subtlety.. but as opening comments to clients go, that was a new one. They laughed. I breathed again. Suffer now they said. Rannoch Moor again then. The forecast was typical Scotland. Typical wind and ‘feckin freezing!’ Poor Sophie. Think that I need to be on coat handling duty today… and Koala taming. She wants to get moving but not before the obligatory bacon roll at the Ski cafe. Then we found ourselves in the bog of Rannoch Moor. It was indeed feckin’ freezing. Not much light but gusting wind! Snow fell on the hills. Today would be challenging but Sophie and Thomas were awesome.. and I don’t use that word lightly. A bit like ‘whimsical’ but better. They danced on cue.. and sometimes just danced. Maybe it was to ward off hyperthermia.. but either way it was effective. They connected. They were in love and getting engaged. It showed.. even in French. But I had a job to do and there was no time for sentimentality. I made the coffee and carried the coats.. ready to hand them back if Koala paused! She was very animated and the expectation was high.. so was the risk of frostbite. First shoot of the year, I need to minimise the risk of clients dying… wouldn’t be too good for business. They laughed and often grimaced. But they were happy and so was Koala, she had the shots and I was given a bottle of Port Charlotte Malt Whisky! I was happy too. We celebrated an engagement and an epic first weekend. Koala never did use the reflector but perhaps I’ll put it with the tripod for next time. I was born in Leeds and grew up in the Military. Which thankfully has put me in good stead to 'look after' the Koala. I carry the tripod, hold the reflector, drive the truck, make the sandwiches and ensure that the clients have everything they need. So basically I do everything apart from press the button... sorry.. shutter! Apparently I am a hidden literary gem so I get to write the blog and provide creative input when asked!